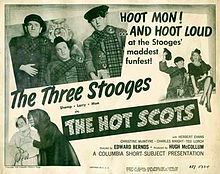 As we celebrate the silly, we might recall that it was on this date in 1948 that Columbia Pictures released “Hot Scots,” the 108th short film featuring The Three Stooges. The Stooges try to get jobs with Scotland Yard after graduating from a correspondence detective school. They end up as “Yard Men” picking up trash and pruning the hedges. They inadvertently get their chance to crack a case when– dressed in kilts and talking in phony Scottish accents– the Stooges (as McMoe, McLarry, and McShemp) are given the task of guarding the prized possessions of The Earl of Glenheather Castle. The castle staff ransack the castle while the boys sleep there, though of course they eventually arrest the thieves. The comedians released 190 short films for Columbia between 1934 and 1959.